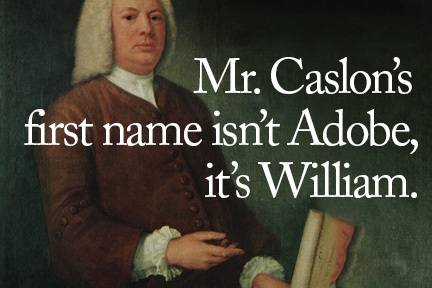 Mr. Caslon's first name isn't Adobe. It's William and he is, essentially, one of our founding fathers. Though I'm speaking for those of us in the graphic design community and not of the rest of the United States per say, William Caslon did end up influencing the image of that famous document to which we owe our freedom today. During the last days of June 1776, the men we know as our founding fathers (Jefferson, Adams, Franklin and the rest) wrote, re-wrote and revised a document that finally became known as our official Declaration of Independence on the morning of July 4th. 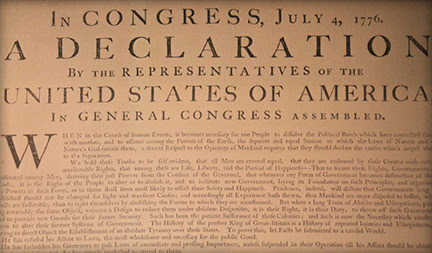 Later that day, Congress ordered the first printed text of the Declaration. This printed version (referred to as the "Dunlap Broadside") was set primarily in Caslon typefaces. William Caslon (1692-1766) created what is cited as the first original typeface of English origin. Today there are many revivals and variations of the Caslon typefaces, all of which are solid standards for designers and printers to turn to for printed communication. Personally, I find nothing better for body copy and many design choices, as exemplified in all of my Little Black Mask marketing materials being set in Adobe Caslon Pro. So on this 4th of July I not only honor our countries' founding fathers — who I thank for their incomparable bravery, genius, perseverace, sacrifice and vision — but I also tip my hat to William Caslon, an engraver, a craftsman, designer and artist who helped shape the way we see the printed word today.